There are times when timing a refinance works out perfectly. Rates drop and are at record lows just when you get ready to lock and start the loan process. Other times you consider doing a home refinance, check mortgage rates and the interest saving isn’t quite big enough to pull the trigger. For those that have the opportunity to gain significant savings on their mortgage by refinancing with little or no closing costs, take advantage right away. Mortgage rates are volatile and change daily. It is very difficult to predict daily rate movement. For those that already have a competitive rate and the benefit of a refinance isn’t available based on today’s rates, not all is lost. What if refinancing doesn’t make sense right now? Just because the benefit of a refinance isn’t there for you today, doesn’t mean you’ll never benefit from a refinance. Mortgage rates fluctuate daily and rate decreases can happen quickly and unexpectedly. This doesn’t mean you have to monitor rates on your own and watch CNBC every day. Some quality mortgage companies will have an option that will allow you to track rates automatically daily, weekly, or be notified when rates reach a specific target. The best course of action is to talk to a mortgage professional and decide ahead of time what rate and cost scenario you need in order to move forward with a refinance. Setting up a target at that time will improve your chances of taking advantage of rate dips, even if they only last for a few days. Trying to time mortgage rates and lock on the perfect day is almost impossible. Similar to stocks, daily rate fluctuation is impossible to predict with a high level of accuracy. The best stock and bond traders in the world only have to be right a little over 50% of the time to make a lot of money. With that said, it is helpful to be aware of what is causing rates to move higher or lower. Inflation, economic data, stock prices and global market trends all have an impact on bond prices, specifically Mortgage Backed Securities, which is what mortgage rates are tied to. If you are working with an experienced mortgage professional they should be able to provide you with insights on mortgage rate trends, what future factors could impact rates moving forward, and the general expectations for rates in the future; however, they cannot and should not tell you with any certainty what rates are going to do tomorrow, next week or next month. Highly-regarded economists consistently provide mortgage rate forecasts, but unfortunately, their predictions are often wrong. The bottom line is that the best course of action for homeowners is to determine when they will benefit from a refinance, track rates (preferably with the help of an automated system), move forward when the opportunity is there, and keep their closing costs as low as possible in case mortgage rates continue to drop and there is a benefit to refinance again in the future. Even if you know with certainty that you want to move forward with a rate you see today, tomorrow, or a month from now, it’s crucial to be prepared to lock that rate in order not to miss out. Don’t be underprepared when opportunity knocks. 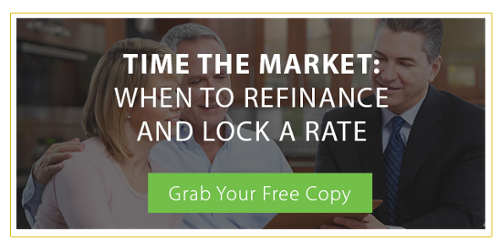 Our ebook Time the Market: When to Refinance and Lock a Rate will set you up for success in your mortgage refinance. No matter how much or how little you know about the mortgage refinance market, you can always reach out directly to an expert. Contact us for advice, answers, and current data on refinance mortgage rates and trends. Last week's economic news included an encouraging report from the National Association of Home Builders, whose housing market index held steady with a reading of 60 in July. This was the 13th consecutive month for readings over 50, which indicate that more builders are confident about housing markets than those who are not. July's reading was noteworthy as it was the highest since November 2005 prior to the recession. In a week of up-and-down trading, mortgage markets improved for the second consecutive week last week.